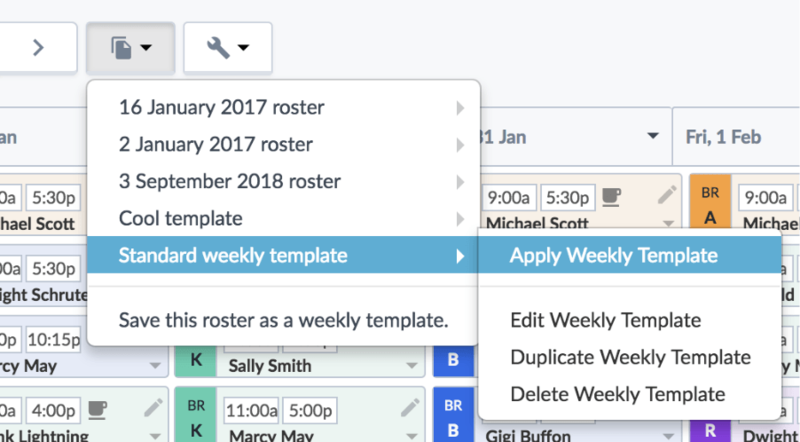 Creating rosters using templates is great because in one click you have an entire roster worth of shifts. But even with templates, there are still a bunch of edits that you have to make after it is applied, for example: swapping out staff who are now on leave or unavailable, assigning staff to vacant shifts, etc. Today, we are introducing Smart Templates, a way to apply a template and have the best staff assigned to vacant shifts at the same time. You can start using Smart Templates today, by clicking the Apply Smart template option in your template menu on rosters. How it works: 1. Start by creating a template that has the coverage you know you need for the week, e.g. you know you need 3 people in the bar on Saturday night and 1 person to always be on the front desk. Note: Only vacant shifts will get adjusted so if you have shifts you don’t want to be altered just make sure those have staff assigned. 2. Apply your smart template. 3. When a template is applied any vacant shifts will have staff assigned automatically using the Tanda’s Cognitive algorithm. The algorithm works like this: Look at all the vacant shifts in the template across the week Avoid adding users with clashing shifts/leave/unavailability Avoid breaking roster validation rules Assign a cost-effective team Aim for fairness by spreading out shifts Read more: What’s new in Tanda — January 2019 FAQ Does it assign staff to shifts on a day by day basis (mon-sun) or does it look across the entire week? The way the algorithm works is it looks for the best combinations across the entire week at once, rather than doing it day by day and making the choices for available staff on the last day the least favourable. If I have shifts in my template that already have staff assigned i.e. full timers, part timers but those staff are on leave when I apply the template will those shifts be swapped out? At this stage no, only shifts that are left vacant will be filled – but we plan on making this part of a future version of smart templates. Creating rosters using templates is great because in one click you have an entire roster worth of shifts. But even with templates, there are still a bunch of edits that you have to make after it is applied, for example: swapping out staff who are now on leave or unavailable, assigning staff to vacant shifts, etc. Today, we are introducing Smart Templates, a way to apply a template and have the best staff assigned to vacant shifts at the same time. You can start using Smart Templates today, by clicking the Apply Smart template option in your template menu on rosters. 1. Start by creating a template that has the coverage you know you need for the week, e.g. you know you need 3 people in the bar on Saturday night and 1 person to always be on the front desk. Note: Only vacant shifts will get adjusted so if you have shifts you don’t want to be altered just make sure those have staff assigned. 2. Apply your smart template. 3. When a template is applied any vacant shifts will have staff assigned automatically using the Tanda’s Cognitive algorithm. Does it assign staff to shifts on a day by day basis (mon-sun) or does it look across the entire week? The way the algorithm works is it looks for the best combinations across the entire week at once, rather than doing it day by day and making the choices for available staff on the last day the least favourable. If I have shifts in my template that already have staff assigned i.e. full timers, part timers but those staff are on leave when I apply the template will those shifts be swapped out? At this stage no, only shifts that are left vacant will be filled – but we plan on making this part of a future version of smart templates. We are pleased to announced that Tanda (PayAus) has full Wage Easy integration, a leading payroll and HR software system. Full integration allows you to use Tanda to track your staff’s attendance and manage their timesheets, and then export the data directly into Wage Easy, and your subsequent HR processes. How does it work? Well, they don’t call it Wage Easy for nothing! New organisations can import their staff from Wage Easy using our super simple staff importer, and a Wage Easy employee report. Check out our user guide for a complete walkthrough. Once your staff are in Tanda, use the system as usual – create rosters, track attendance, manage timesheets, and enjoy real time reporting. At the end of your pay period, you can export your timesheet data into a Wage Easy file, which you can import straight into Wage Easy – never fill out a timesheet manually again. Again, our user guide has all the details. Wage Easy joins MYOB as fully integrated Tanda systems, allowing us to better service even more small and medium businesses in Australia. Are you using Tanda to make your business run smoothly yet? If not, try a free demo today and experience the difference – it’s easy. Development: Renee is part of the software development team working as a UI/UX designer. She is responsible for designing Tanda in a way that provides the best possible experience for our users.